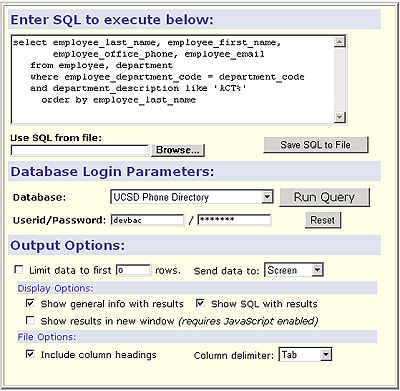 Use this guide to review how to create a select SQL statement to use in the SQL Executer. As you review the statements and clauses below, note that brackets identify optional information.Include a bracketed item if you want to select more specific data. For helpful hints and problem solutions, SQL Review and Troubleshooting. Note: If you don't know the SQL programming language, you can use QueryLink by clicking the Queries button in FinancialLink, EmployeeLink, Student/ Class Info tools, and DataLink. 1. Start your query with the select statement. A select statement queries the database and retrieves selected data that match the specified criteria. 2. Add field names you want to display. The field name specifies the particular fields that contain the data. Note: You can find field and data table names in the Data Models section of DataLink. 3. Add your statement clause(s) or selection criteria. The from clause specifies the table(s) that contain the data. The where clause specifies the selection condition(s) by which data is retrieved. The order by clause specifies the ordering or sorting of rows. The group by clause groups the resulting rows in sets. The having clause allows a search condition and is used with the group by clause. 4. Review your select statement. The example below shows SQL being used in the SQL Executer to produce a phone list of all ACT staff by last name. The list will show last names, first names, phone extensions, and e-mail addresses. Contact the Data Warehouse team or enroll in a SQL training class.